When a woman embodies her feminine essence, her whole life is transformed. She becomes attractive, grounded, and sensual. When she walks into a room, everyone appreciates the glow of her feminine radiance. 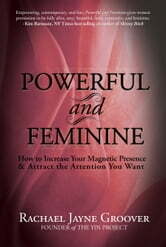 Men notice her, including the healthy, loving, masculine ones she desires. She does not need to project a powerful persona to attract the respect she wants. A forced sense of masculine power is nothing compared to the ecstasy, empowerment, and effortless magnetism that are released when a woman activates her feminine essence.